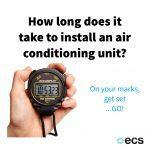 How Long Does It Take To Install An Air Conditioning Unit? Want to install an air conditioning unit? Who has the time? We live in a world where everything needs to be instant; fast food, faster cars and super fast broadband. A 21st century life is all about instant gratification, quick fixes and fast paced services. Things need to be speedy, simple and easy to make them worth our time. In a world where time wasted becomes an anxiety provoking stress, we advocate speed. Especially when it comes to the install an air conditioning unit. Think about the most stressful times in your life. Moving house, renovating a house…pretty much anything to do with spending money on or in a house comes firmly on the list. Why are these experiences so stressful? Normally time is the biggest bug bearer. People complain more about how long things take over any other issue when it comes to the home. So when you are investing in upgrading your sanctuary you want it done fast so you can return to a zen like state in your personal space. This is where we come in…. most air conditioning installations take days if not weeks to install. Unfortunately this isn’t a plug a play product so unlike a fridge where its delivered in a box and all shiny and new gets plugged in and the delivery men are gone in under and hour, to install an air conditioning unit takes time. How much time are we talking? Well to install an air conditioning unit in a single room where everything is complete post renovation is called a retrofit. This type of installation can be done in as little as 4 hours if it is back to back. 1-3 meters of inter- connecting refrigerant pipes and comms cables need to be run between the indoor and outdoor unit. Fancy a little bit of technical? The indoor unit of an air conditioning system that is run on gas is called an evaporator. The outdoor unit is referred to as the condenser. ..so much so that by using it over conventional heating and cooling can save you money on your energy bills… green tick for the eco warriors. We digress with the technical, you are here for the fast paced answers not the long winded jargon sooo in short to install an air conditioning unit can take as little as 4 hours, with most residential air conditioning installation splits taking no more than 1 day start to finish. Watch a recent start to finish installation that was done in 4 hours by our installation engineers. Home Air Conditioner Unit Heat Better Than Boilers? 0 comments on How Long Does It Take To Install An Air Conditioning Unit?